Among the special cases our company has dealt with is the conservation of the building status quo when creating elevator pits in existing buildings. For greater depths, we also undertake excavation of the elevator shaft. We are able to move smaller building structures or elements horizontally. This process requires a suitable thrust support which is prepared individually. In earthquake regions, there is the option of building-in spring elements instead of load distribution beams. The same system can likewise be applied to isolating vibration in machine foundations. By utilising this method, the machine foundation for a large milling centre with a maximum permitted settlement of 0.15mm per half-year was set on deep foundations. On a smaller scale, underpinning is possible by horizontally press-driving larger hollow sections. For special requirements, the ERKA-Pile can also be combined with spring elements. In this case with a spring element from the company Gerb Schwingungsisolierungen, Berlin. Machine foundations – Pile heads and reinforcement. Because of the low settlement tolerance for a milling centre of 0.15mm per half-year, only a deep foundation into the existing clay could be considered. Prior to creating the foundation, steel tube piles, approx. 5 metres long were driven down onto solid rock. The finished foundation was recessed to take the machine. 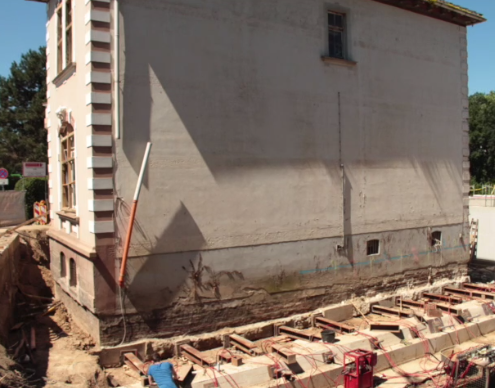 Machine foundations – Because of the low settlement tolerance for a milling centre of 0.15mm per half-year, only a deep foundation into the existing clay could be considered. Prior to creating the foundation, steel tube piles, approx. 5 metres long were driven down onto solid rock. The finished foundation was recessed to take the machine.